What do you think feel is the secret behind good hair day? Apart from healthy diet and lots and lots of water, the next in line are the Hair products. In other words what you apply is what gets reflected. The market is full of hair care product for you to choose from. 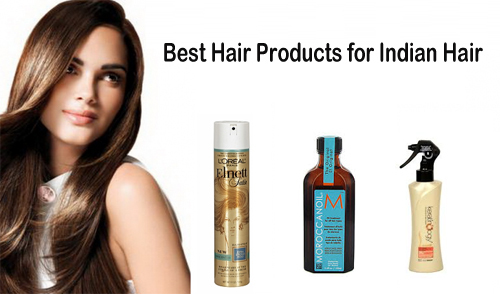 It provides options for all kinds of scalp and solutions for all kinds of hair problems. The ultimate goal is definitely to provide you with thick lustrous hair you would love flaunting all day long. L’oreal Paris Elnett Satin Hairspray is an expert recommended product for promoting hair growth. This hair spray does not frizz your hair and neither does leave any kind of white cast. The best part is its price. It is not at all expensive and you get to do all your style without compromising on the quality. However, it has a few minuses too. You require spraying and spreading it eventually otherwise your hair gets harder. Again the strong smell might be unbearable for some. L’oreal Total Repair 5 Serum protects your hair against split ends at it nourishes hair from root to tip. This results in detangling of hair without breakage. Effects can be seen from the first use itself. Your hair gets softer and shinier with no limp formation. Plus it is very affordable too. However, this serum may cause dandruff and make your hair texture sticky. Moroccan oil gets absorbed by the hair quickly and hence promote a healthy, shiny and silky finish. The presence of unique and rare antioxidant argan oil make the hair non greasy and leaves no limp. Champi with this hair oil improves its texture and at the same time act as mild heat protector too. A light version of the oil is also available for oily scalp. But hair care product is far too expensive for frequent usage. Plus it is only available at selected salons hence not easily available. Habibs Henna is superb for people dealing with problems of grey hair. This product is totally natural with no ammonia or harmful chemicals. It covers grey hair and also at the same time highlights them. The Bhringraj, Brahmi and Amla content present act as hair conditioner. Soak it for just 30 minutes and directly apply for lustrous and shiny hair. It is also effective for oily scalp. Cons include its price. It is expensive compared to other brands in the market. Also it is available only in the metros. Sunsilk Keratinology Heat Protector Spray can be applied before prolonged exposure to heat. For example consider using this spray before ironing, curling or blow-drying to protect any damage to your hair from high temperatures. This product is easily available in India. The Keratins and UV filters provide shine and strength to your hair. However, over spraying might create an artificial layer on hair. This heat protector spray is also not ideal for places with high humidity. Moreover, it does not work well with frizzy hair.